It's time for another round-up of projects that are looking for volunteer help, whether in the form of transcriptions, information, or time. If you have an hour or two a week to spare or some specialized knowledge, maybe you're just the person for one of these requests. As is becoming more and more common, several of the projects are asking volunteers to transcribe digitized information. McGill University in Montreal, Québec is hoping people will be interested in working on 150 years of meterological observations from the McGill Observatory. 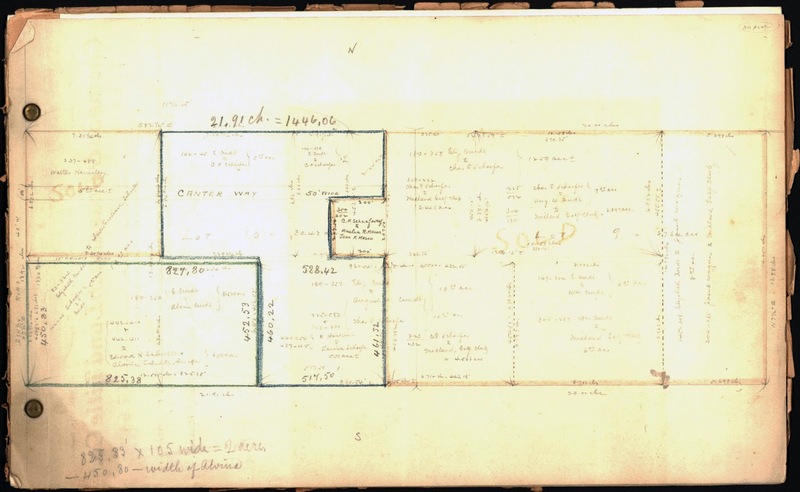 The focus of the Data Rescue: Archives and Weather (DRAW) project is studying the historical weather data to identify patterns and trends, but an article notes, “The Observatory ledgers are also full of interesting little notes about the daily lives of our ancestors." 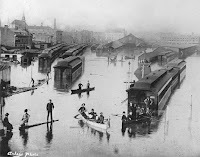 So if you had relatives living in Montreal, you can learn more about what their weather was like and how it affected them. The project site is still in a beta testing stage, but interested participants can sign up now and practice using the transcription tools. Yale University's recent foray into crowd-sourced transcription work is all about the drama — Yale's School of Drama, that is, along with the Yale Repertory Theatre Ephemera Collection. 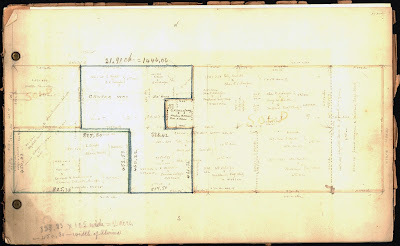 The aim of the Ensemble @ Yale project is to create a database of Yale theatrical history. Volunteers can browse digitized programs spanning more than 90 years and transcribe play titles, production dates, and names of directors, cast, and crew. Once the first two collections have been transcribed and put into a searchable database, more Yale theater-related collections will be considered as additions. If you had a family member at Yale or are into theater history, this may be the project for you. If you register on the project site you can create a family tree. The transcription site provides instructions on how to do the transcription work, and lists locations and whether documents have been finished or are waiting to be worked on. Something I didn't find on the site is a list of what documents are being used, which would be useful for determining whether Jewish individuals might be included in the database. There are enough volunteer transcription projects now that someone has created a page to aggregate them. 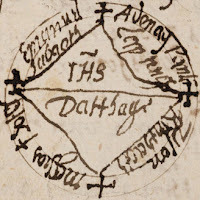 It's on an education-oriented blog, and the focus is on students working with historical texts, but it's a nice collection of links conveniently grouped together. 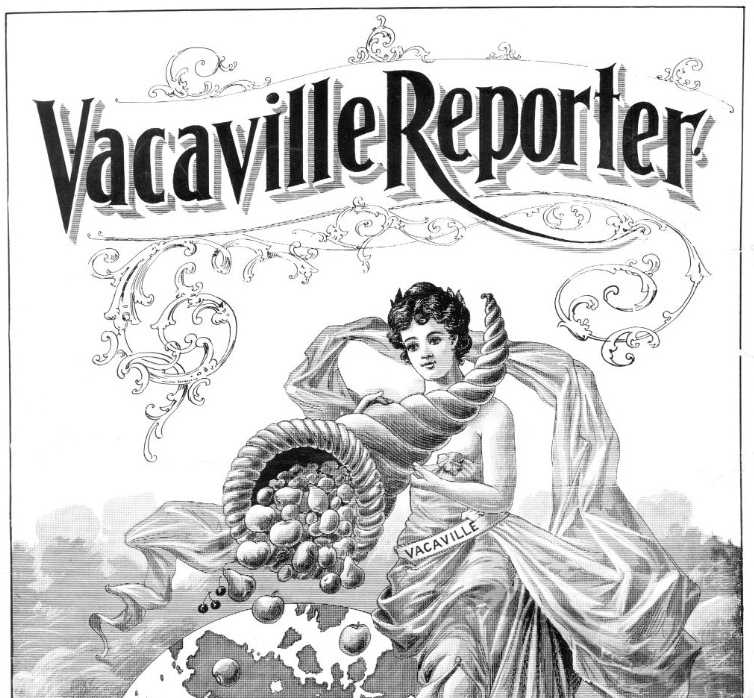 A local request for assistance comes from the Vacaville (Calfornia) Heritage Council, which is looking for volunteers to take on projects such as scanning photo negatives, researching local history, organizing donated historical material, and various computer tasks. 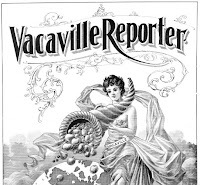 Some of the historical items that scream to be cared for are the Vacaville Reporter's newspaper collection from 1930–2006, microfilm of newspapers going back to 1883, and photo negatives. Interested individuals can contact council president Doug Rodgers at the e-mail address given in the article. Three more local requests, these from museums in eastern Contra Costa County, California, were featured in a recent newspaper article. The Antioch Historical Museum, East County Historical Museum, and Pittsburg Historical Museum and Society have each received healthy donations of newspapers, microfilm, and other historical items that now need to be sorted and prepared for access. Contact information for each of the groups is in the article, if you have the time to help. Dr. Kimberly Jensen, a professor at Western Oregon University, is trying to find more information about The People's Bulletin, a black community newspaper published in Portland, Oregon. The only known surviving issue, from June 7, 1917, is Volume 1, Number 34, and is held at the University of California at Santa Barbara's Special Research Collections, as part of its “Portland [Oregon] African-American Collection, circa 1900–1970.” So far all documentation for the newspaper indicates only the year 1917, although June 7 was in the 23rd week of 1917, so the first issues should have come out in 1916. It's obviously a very rare paper; it isn't even listed in the Chronicling America directory. Anyone who can provide information about The People's Bulletin is asked to contact Dr. Jensen at the e-mail address given in the article linked above. There are always lots of Irish projects going on. A releatively new one is Epic Journeys - Ellis Island, which aims to document the Irish experience going through Ellis Island. The project began in 2015 with a focus on the parish of Tulla, County Clare but has now expanded to other departure points in Ireland, including locations in the counties of Cavan, Cork, Galway, and Tipperary. The Web site is currently going through an upgrade, so contributions cannot be made through it directly, but they can be sent via an e-mail address on the site. The Edmonds Historical Museum (in Snohomish County, Washington State) is asking its area residents, whether military veterans, current service members, or civilians, to come forward and share their wartime memories, from World War II through to the recent War on Terror. All interviews will be shared with repositories for permanent preservation, and participants will each be given a copy of the oral history interview to keep and to share with family members if desired. After November 2017, the interview project will expand to general memories of Edmonds and south Snohomish County. Details and contact information are in an online article about the project. 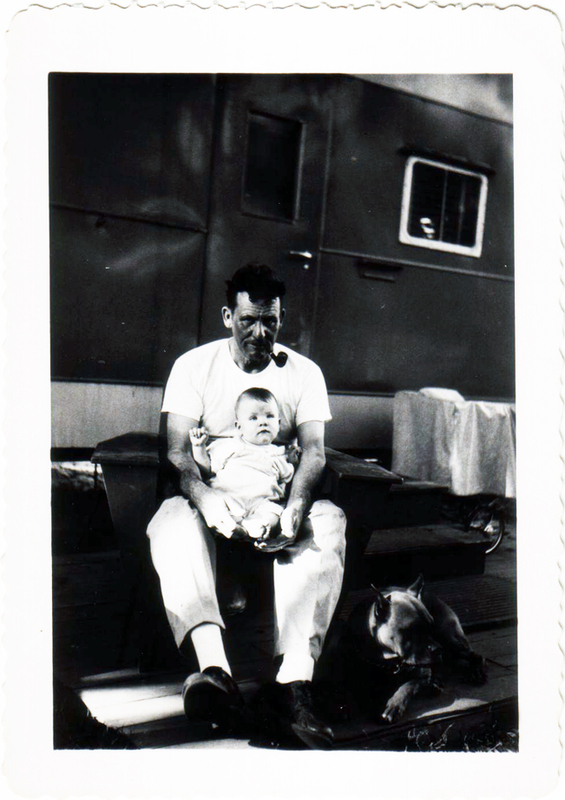 This one isn't directly genealogy-related, but identifying the person should help one family. Authorities from Orange County, California have put out a public request for help with their oldest cold case, who is a Jane Doe. "Jane" was found dead on March 14, 1968 in Hungtington Beach, California. She was estimated to be 20–30 years old, 5'2"–5'3", and about 130–140 pounds. More information about her case, including the clothing and items found with her, is on the Defrosting Cold Cases blog. The last project I'll mention today has nothing to do with genealogy, but it just sounds really cool, so I want to share it. How would you like to transcribe magical manuscripts? The Newberry Library in Chicago is giving you that opportunity. The Book of Magical Charms describes how to care for toothaches, cheat at dice, complete a conjuring, and speak with spirits. How can you possibly pass that up? Atlas Obscura has an interesting article about the project, and you can visit the transcription project site to get started. This sheet, and each of the three that follows, measures 8 1/2" x 14", the standard for legal size. 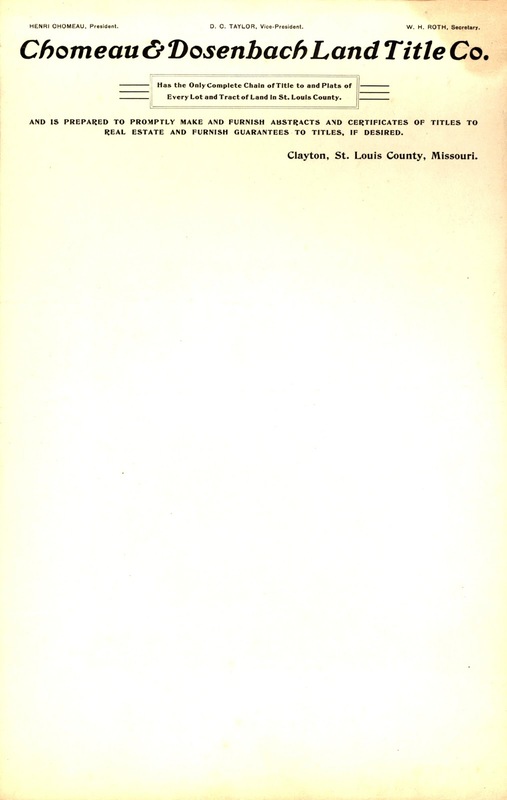 This first sheet is slightly yellowed but appears to have originally been a creamy off-white. It's a heavy bond, possibly more than 20#, with a very sturdy feel. 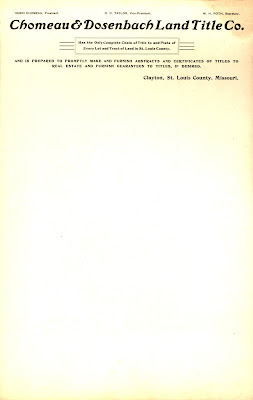 It has a watermark that is difficult to read, but I can make out "Byron / –eston Co / —n Recor— / 1918." I think the first two lines might be "Byron Weston Company", but I'm stuck on the next word. 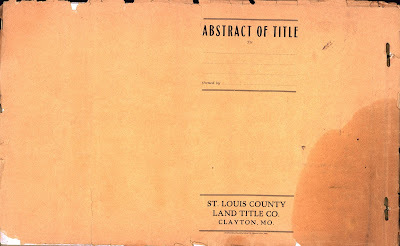 This is a sheet of letterhead for the St. Louis County Land Title Company. Everything is typed on the page except for a check mark in pencil on the left and one sentence in pencil at the bottom: "Where does the eastern boundary come in?" These three pages are of a lesser stock than the first. They're all a muted yellow-orange with stronger color at the top. Everything on each is typed except for a penciled check mark to the left of each transaction. 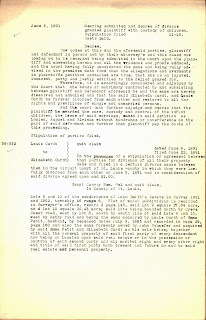 The first page tells us that the set of documents is a chain of title to lots 9 and 10, which are the land at the center of the dispute between Jean and Emma La Forêt and Emma's three Curdt siblings. The receipt posted last week says that the order was for lots 9 to 16; we'll have to wait until we go through all the pages to see which is correct. It's clear that Jean copied the information from these entries to create his abbreviated version, which did not include all the details for every transaction. But he wasn't perfect with his copying — the first mistake comes in the first entry, with the name Solomon, which Jean typed as Salomon. From these four pages, Jean copied the first entry in its entirety. On the second page, he took highlights of the first three listings and then copied the fourth completely. He seems to have copied everything from the third and fourth pages. 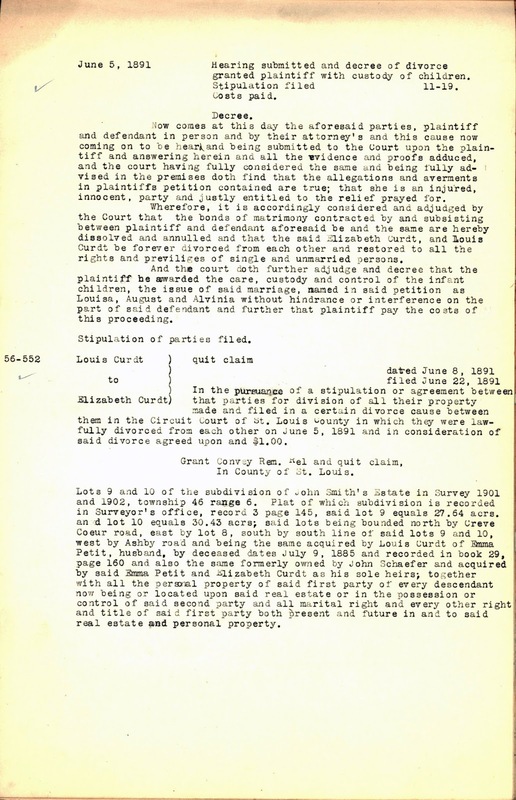 One question this resolves is why the land was referred to as a subdivision of John Smith's estate in the legal waiver that Louis Curdt signed. 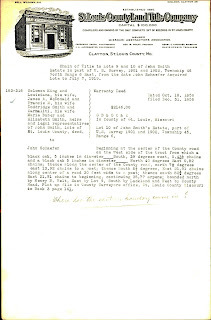 John Smith's heirs sold lot 10 to John Schafer. Apparently Mr. Smith wanted to make sure his children's names stood out a little more than his: Louisiana Smith and Doddridge Smith are decidedly less common. John Schafer purchased lot 10 directly from Smith's heirs in 1856, but he didn't acquire lot 9 until 1864, almost ten years later. He purchased that land from Rufus and Mary Lackland, who do not appear to have been Smith's heirs. 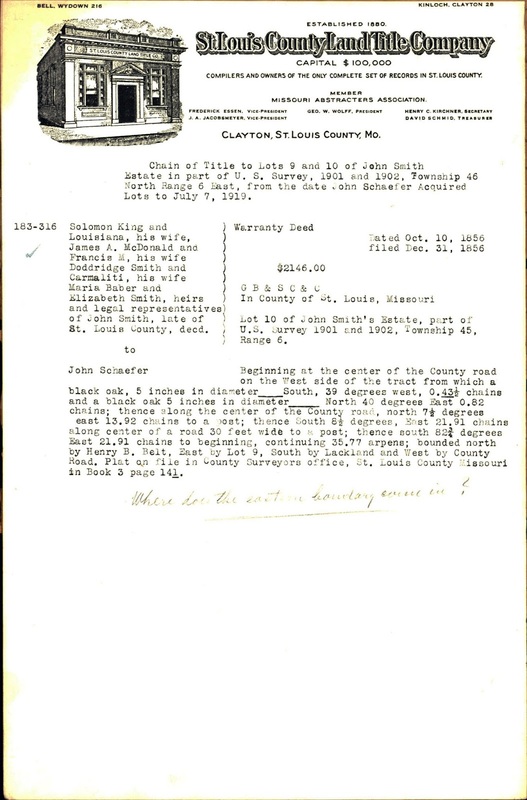 Since the chain of title was concerned with the properties from the time that Schafer had them, we don't get information on when the Lacklands bought lot 9, but the description mentions 182-116 and that it was part of Smith's estate. 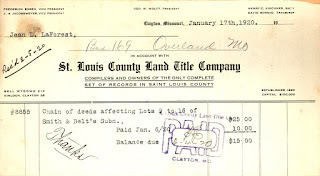 Schafer's purchase of lot 10 was 183-316, so it was probably not long after the Lacklands bought lot 9. Comparing the descriptions of the two pieces of land, one finds a lot more detail in that for lot 10, which uses landmarks ("a black oak, 5 inches in diameter"), degrees of direction, chain measurements, and roads to define the plot. 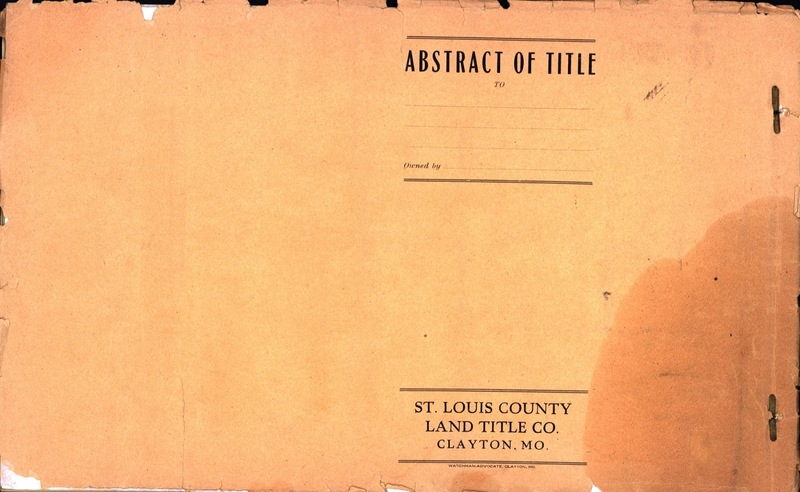 The description of lot 9, on the other hand, is distinctly less precise — "32.49 arpens, more or less" — refers to a file in the surveyor's office instead of giving details, and has spelling errors ("noreth" for north, "be" for by). Maybe the two transactions were processed by different clerks. I can see some logic to Elizabeth's letters of administration being listed here, as her appointment meant that she was in control of the land, but I'm surprised that information about the family's marriages and divorces appears in the chain of title. I don't think they're normally registered at the same county office as land transactions. When I looked at Jean's compilation, I figured he had obtained documents from multiple sources. 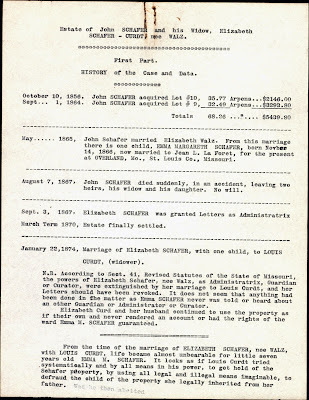 But the chain of title refers to the marriage records; why? Here's another confusing thing about these documents: Why are some letters and numbers underlined? On the first page, we see "0.43 1/2" and "page 141". On the second page, there are "Smith's" and "plat". The third page has "Miss" Elizabeth Schafer, but that might have been underlined to emphasize the error, as a widow should be Mrs. But why does the last entry have "Schafer" twice and "Kink"? Happily, the fourth page has no strange underlines. It appears that the check marks on these pages might simply have indicated that Jean had copied what he wanted from the entries, since he checked every one. I don't know why someone wrote the question on the first page, though. The description of lot 10 says it is bounded on the east by lot 9. (That information is confirmed in the description of lot 9, which says it is bounded on the west by lot 10.) So if the eastern boundary is defined, why would someone ask where it comes in? This week for Saturday Night Genealogy Fun, Randy Seaver is following up on another question on the Family History Hound's list. (2) Please answer the question, "What heirloom do you have that has been handed down through the generations?" I'm a little short on heirlooms in my family. On my father's side, my grandfather's father died young and the family was poor. (In fact, my great-grandfather's mother paid for the funeral.) If there were any heirlooms or family items, I haven't heard about them. My grandmother's family were farmers in southern New Jersey, again without a lot of money. Perhaps there was a family bible on one side, but if so it went to a different line in the family. My mother's grandparents on both sides came to the United States as poor immigrants with not much more than the clothes on their backs. I don't know of any significant items they brought with them from Europe. That said, the closest thing I can describe as an "heirloom" is the set of silver-plated flatware that my great-grandmother Sarah Libby (Brainin) Gordon owned. The utensils don't have a monogram or family initial and the set isn't anything really fancy, but I guess I'm now the fourth generation to have it. I used the set every year when I held my annual Passover seder (dinner), for about thirteen years or so, but I haven't been able to do that for the past four or five years. I'm hoping to be able to start again next year. 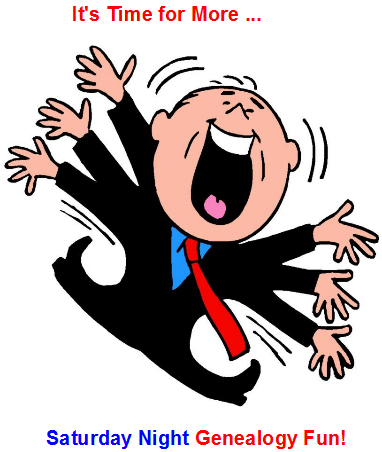 (2) Tell us which GMP you use, and how many persons, places, sources, etc. are in your database(s) today in a blog post of your own, in a comment to this blog post, or in a Facebook status or Google+ stream comment. NOTE: We last did this in June 2016. For comparison, here's my post from last year. 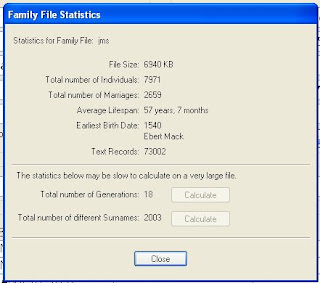 During the past year I have added 87 individuals, 37 marriages (most gained from the release of the New York City marriage index, I think), and 33 surnames. The average lifespan has gone up by 3 months. The earliest birth and the number of generations have remained the same. The text records have increased by 1,237, but since I don't know what those are (notes, maybe? ), I don't really know what to think about it. The file size increased by 105 kb. I added some information this past year, but I have a lot more I haven't gotten to. I really need to find some free time! This page was clipped to two others that are carbon copies of it. Unlike many of the carbons I have looked at while ploughing through the reams of paperwork that Jean La Forêt created (and I'm pretty sure he typed this one also), none of these three pages has been amended in a way to make it different from the others, which is why I decided not to post the other two copies. They're all exactly the same in content. As mentioned above, everything is typed on the paper, so no transcription is required. Only two changes were made to what was originally typed. First, near the top, in the section that begins "May ...... 1865", at the end of the second line, the word beginning with "Novb" had the letters "er" typed over whatevrer was there to begin with, which is no longer visible. Second, at the bottom of the page, at the end of the last paragraph, "Was he then abetted" was typed and then erased on all three copies. Most of the facts presented here have been seen in previous documents from Jean. 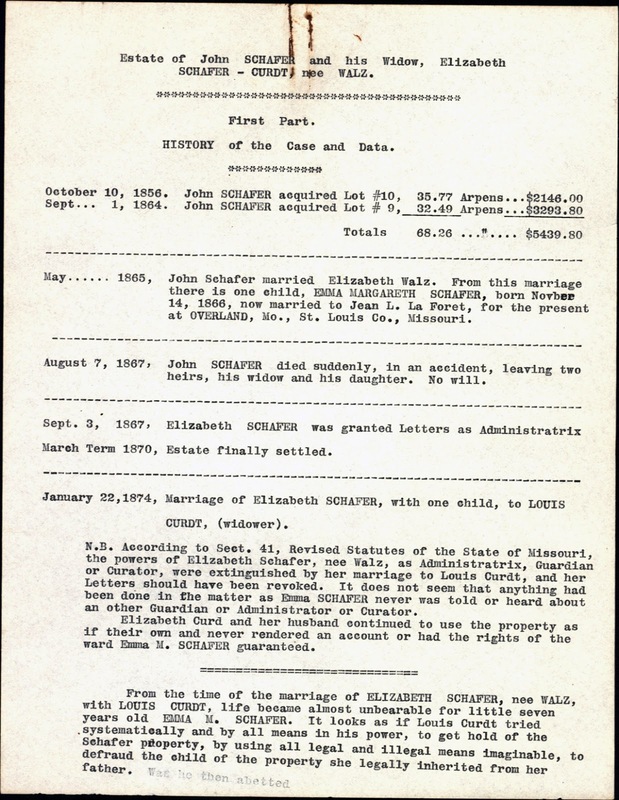 The new piece of information is in the last section, which points out that when the widow Elizabeth (Walz) Schafer married Louis Curdt, her powers as administratrix of her late husband's estate and any position she may have had as guardian of the property for her daughter, Emma Margaret Schafer, would have passed to her new husband. 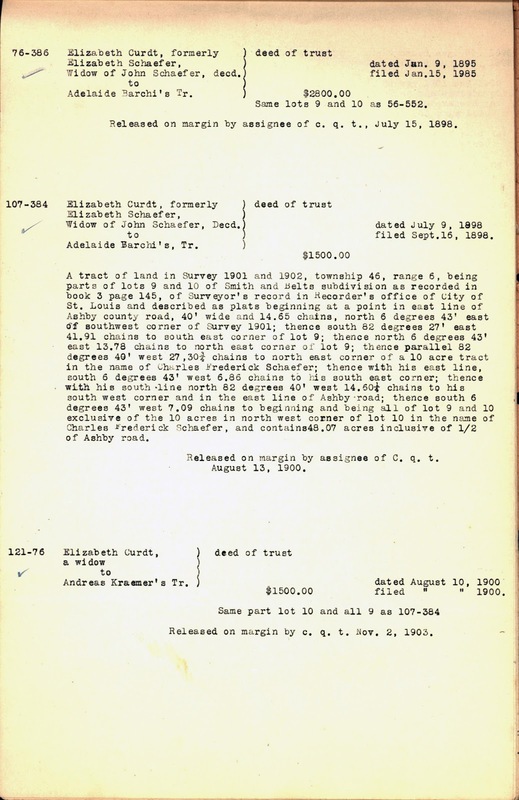 The document also states that Louis and Elizabeth Curdt never reported an accounting of the estate. 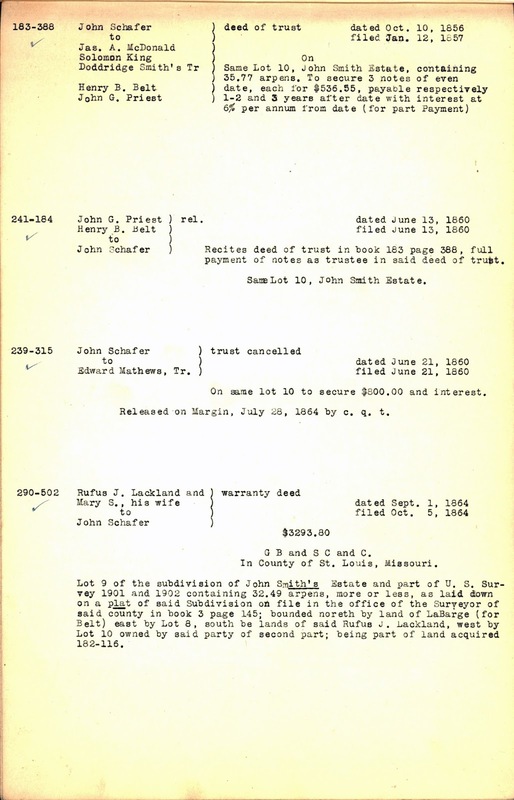 Since John Schafer died intestate, the disposition of his property would have relied on the existing laws at the time in Missouri. 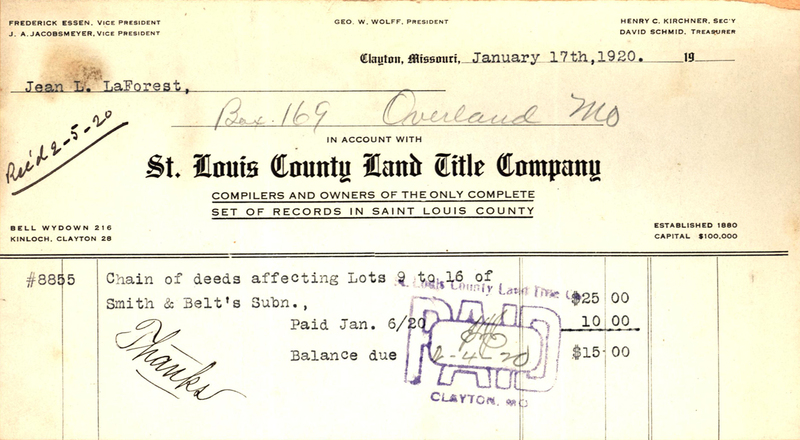 While Jean did quote from The Revised Statutes of the State of Missouri, 1899, an important section that did not appear on that sheet was the actual order of distribution of property when there was no will. On page 739 in the edition of the Statutes which I found previously, Section 2908, "Real and personal estate descends, to whom", states that after debts are paid and the widow receives her dower, the estate goes "[f]irst, to his children." That would have made Emma the sole heir after her mother had received her share as widow. As Emma was a minor when her father died, a guardian would have been appointed to oversee the property that was to come to Emma when she reached adulthood. 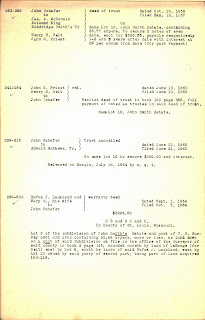 I find it significant that nowhere in all the papers I received when I was talked into taking this on is there a copy of any documents having to do with John Schafer's estate: no appointment of administratrix, no inventory, no list of debts, no distribution, no guardian report, no nothin'. Considering how diligent Jean appears to have been with other aspects of documentation and saving paper, that's rather surprising. Perhaps he did acquire a copy, which is what led him to say that the the Curdts never "rendered an account." So now I have to wonder if those documents were among the others and were removed by an unknown person at some point in the past. 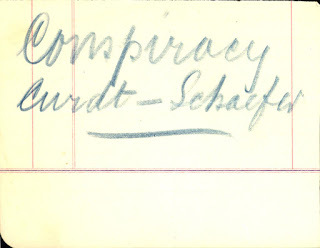 After I've gone through the remaining papers in my little treasure chest (there's still quite a pile left), obtaining a copy of John Schafer's probate file may have just moved to the top of my to-do list. The path to the discovery had begun two years previously, in 2002. I had visited my grandmother in south Florida, and we had eaten lunch with cousins on her father's side of the family. 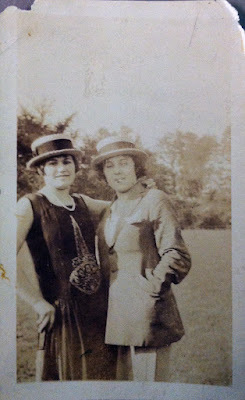 During conversation, Bubbie (Yiddish for "grandmother") had made comments to various of the cousins there: "I have a photograph of your parents on their wedding day." "I have a photo of your brother when he was a baby." "I have a photo of your mother." And she promised to give them the photos. When Bubbie and I returned to her apartment, she instructed me to pull out four big boxes of photographs. We went through them, not focusing much on the photos in general but searching only for those to be given to the aforementioned cousins. I was not permitted to label any of the other photos. We ended up with a small pile of about seven photographs, which she would make sure got to the appropriate cousins. Fast forward two years to 2004. My grandmother's memory had started to slip a little. In conversation, she began to repeat statements and questions four or five times. I was already planning on a trip to the Orlando area for Thanksgiving to visit a cousin on my father's side. 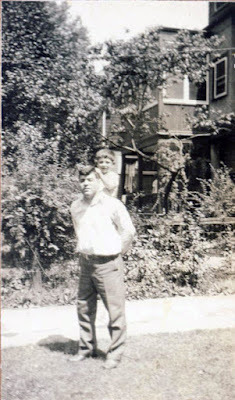 I remembered those four boxes of photographs, all unlabeled and unidentified beyond my grandmother's memory, and worried about identifying them before it was too late. So I made a spur-of-the-moment decision. I called Bubbie and asked if she would like me to visit for a few days. I added a round-trip ticket from Orlando to Ft. Lauderdale to the front end of my existing trip. 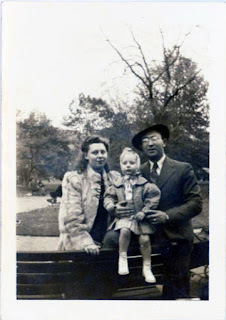 When I arrived at Bubbie's apartment, I asked if we could look through the boxes of photographs again, and this time could I label them, please? I was surprised and elated when she said yes. I had prepared by bringing a large supply of sticky notes. I brought out the boxes again, and every time Bubbie identified a photo — "This is my grandparents, Mendel Herz and Ruchel Dvojre." "This is my parents' engagement photo." "This is Uncle Willie in his Army uniform." — I wrote a short note on a sticky and put it on the back of the photo. Bubbie looked at one photo and announced, "I have no idea who these people are," then tossed it aside. I picked it up to check it out. 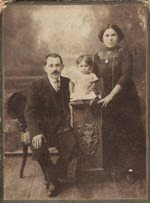 The photo was of three people: a man seated on a chair on the left, a young child on a column in the middle, and a woman standing on the right. The printing on the card was in Cyrillic and gave the photographer's name and location, Kamenets Podolsky, Russia. I knew that's where Bubbie's father and grandfather were supposed to have been from, so I thought the people might be relatives. I asked if I could take the photo with me, and Bubbie said, "Sure." After working through all four boxes, almost everything was put away again and I had far fewer sticky notes remaining. The photos for the cousins which had been pulled out two years ago were still sitting around, never having been delivered, so I was allowed to take them (and accept responsibility for mailing them), in addition to the unidentified photo of three people in Kamenets Podolsky. When my visit with Bubbie was over, I flew to Orlando to spend Thanksgiving with my cousin and his family. While I was there, I talked about the photographs my grandmother and I had pored over and the few I had been permitted to take away with me. My cousin's wife was interested in seeing the photos, so I brought them out. We looked at the ones destined to be sent to cousins and then came to the one from Kamenets Podolsky. Fern declared, "We've seen her before!" My response: "We have?" We went slowly through the photographs and came to the one Fern was talking about. The photo was one that my grandmother had identified as being of Sarah (Gordon) Millstein, a younger sister of my great-grandfather Joe Gordon. She was the spitting image of the woman in the photo. They looked so much alike, one might easily think they were of the same person, or that the two women were twins. The giveaways were the clothing and the photographer locations. The woman in the Russian photograph is wearing a lovely Victorian dress, whereas the photo of Sarah shows her in a stylish 1920's dress, a moment captured by a photographer in New York City. So if the Russian photograph wasn't of Sarah, who could it be? 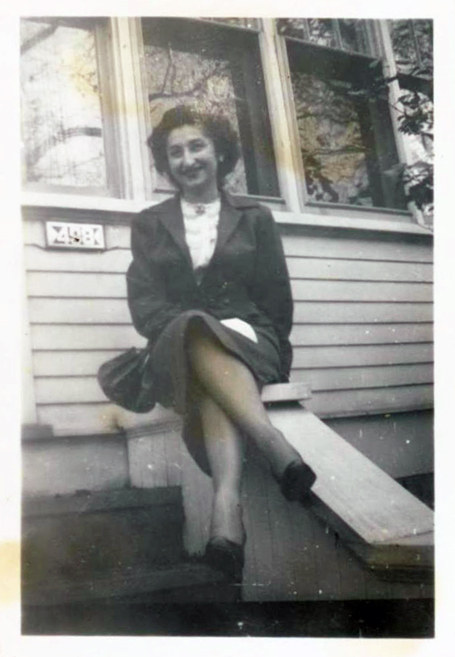 Given the clues of time and place, I realized it was probably my great-great-grandmother Esther Leah (Schneiderman) Gorodetsky, Sarah's mother, and also mother of my great-grandfather. She died in Kishinev (now in Moldova) in late 1908, a month after the birth of her eighth surviving child. Early the next year my great-grandfather began the chain migration of the family to the United States. I was very excited but not quite willing to commit. When I returned home I compared the man in the photo to a known photo of my great-great-grandfather Victor Gordon (formerly Gorodetsky). It looked like the same person! Furthermore, I could date the photo, to approximately 1890. The child in the photograph appears to be a little girl. The oldest child in the family, my great-grandfather's older sister, was Etta, who was born about 1890. All the pieces were fitting! Because Esther Leah died in Russia, any photos of her had to have been taken there. So far this is the only one that has surfaced. I thought it was such an important discovery that I had the photo digitally cleaned up and then mailed prints to all the cousins on that side of the family, so everyone would know what Esther Leah looked like. I did not want her to be forgotten again, tossed aside with a comment of "I have no idea who these people are." There wasn't a Treasure Chest Thursday post last week, partly because I was at the IAJGS International Conference on Jewish Genealogy, and partly because the large flatbed scanner I have been using was out of commission. 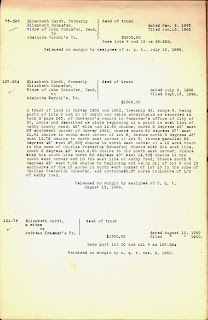 When I returned from Florida, however, I discovered that the scanner had been repaired, so I started scanning the oversize pages regarding the property/inheritance dispute between Emma (Schafer) La Forêt and her Curdt siblings. While I was scanning, this little scrap of paper jumped out, begging for attention. I have to admit, I laughed when I first saw it, but I thought it was a fine way to get back into the spirit of Jean's feelings regarding the entire situation with the Curdts. The paper is 5" x 3 13/16". It's a grayish off-white with lines lightly printed in blue (I think), columns in red, and a border in red and blue. It was neatly torn off of a larger piece of paper. It looks as though it might have come from an accounting ledger or something similar. 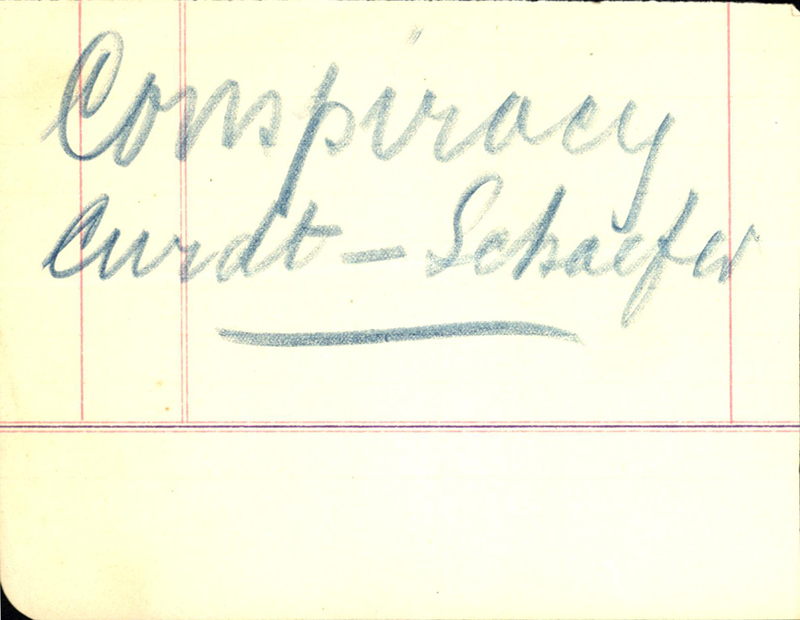 "From this time on, there existed a Conspiracy to defraud and despoil EMMA M. SCHAFER of her property." "Thus Elizabeth Curdt disclosed her partnership in the CONSPIRACY, and stuck to her criminal husband against her first child." So it's very clear what Jean thought of the goings-on. Maybe this little note was the first time he had put it in writing.